Puzzles are often found in preschool and kindergarten classrooms as a fun toy. But, what about in upper elementary classrooms? 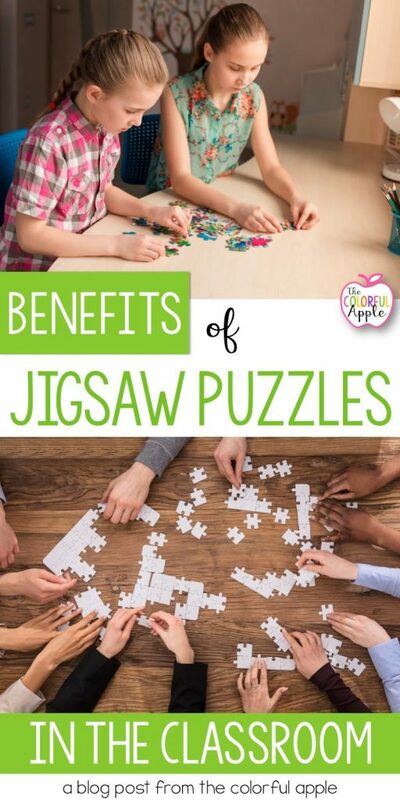 Using jigsaw puzzles in the classroom can offer benefits for students of all ages. When my students finished their work early, my response was always the same – “read a book!” While this is a great motivator for some, others didn’t always want to read. This response from me actually turned them off from reading. Not what I wanted to do! One day, I visited a colleague’s room and noticed that he had a partially finished puzzle sitting on a back table. He explained that his students enjoyed working on it when they had a few extra minutes during the day. Genius! It got me thinking of all the ways that puzzles could be beneficial in the classroom. 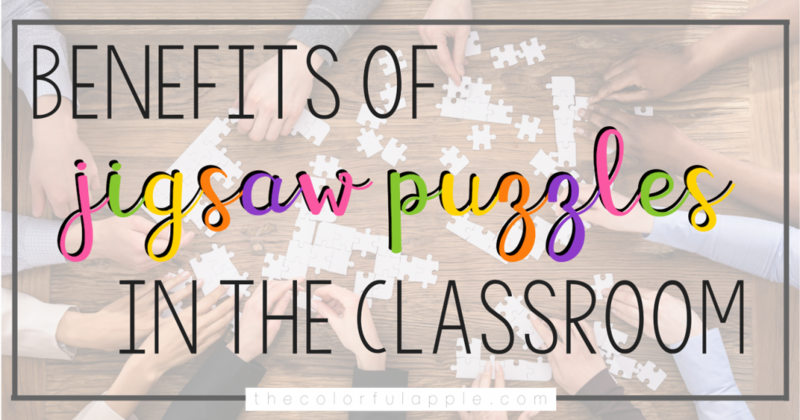 Setting up a puzzle table in the the classroom can make a huge difference! Open the box, spread the pieces out and invite students to get involved. The puzzle is a very open-ended activity for students, so it is important to have some structure. Having expectations will make the puzzle table an effective resource. Create a maximum number of participants at one time. I recommend 4-5 students depending on the size of your table and the size of your puzzle. The voice level at the puzzle table should match the classroom voice level. Is the rest of the class working silently, in partners or groups? Always check the floor for pieces before returning to your seat. Get excited about it! 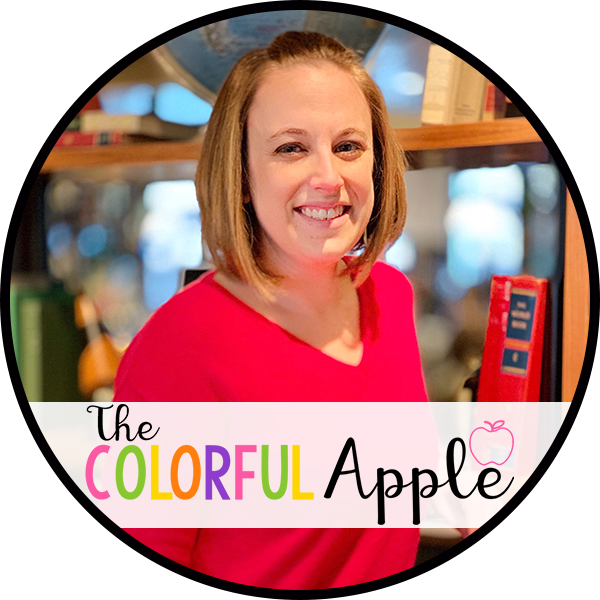 Your students are interested in anything that you are excited about. When switching out puzzles, try holiday or themed ones. You could even find puzzles that match what you are learning in class (see examples below). Make the puzzles challenging! Start with 300 pieces for 1st and 2nd grade classrooms. 4th and 5th grade students would do better with a 500 piece puzzle. The puzzle table doesn’t have to stop with your current students! You could invite past students to come back when they need a break. Not only will this help that particular student, but your class will become more invested as well! 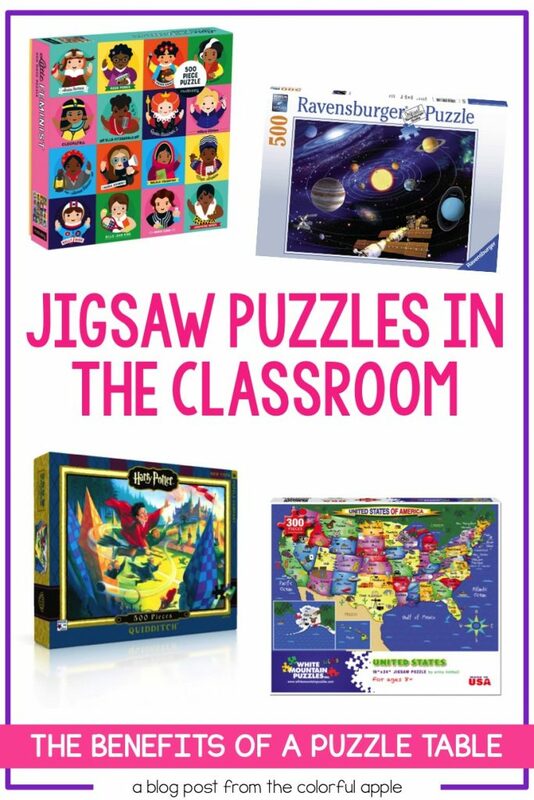 I rounded up some of the best jigsaw puzzles for the classroom. Some are educational, some are challenging and some are just downright fun! I challenge you to set up a puzzle table in your classroom! A jigsaw puzzle is an authentic way to expose your students to soft skills and to build community. You’ll be amazed at what a great experience this is!